The ZTE Concord II is a smartphone being introduced by ZTE in the US market, through the T-mobile and MetroPCS carriers, named the same for the latter but with the former, it is available as the T-mobile Concord II. Available from 19th May, the Concord II will cost you nothing down with the 2-year contract with any of the networks, and the monthly plans in this contract start at $40 but these aren’t any EMI plans, as you get the calling minutes, data and the SMS in it. ZTE has hit the budget smartphone market at the right time when Motorola has made the Moto G available with both, the 3G and the LTE variants at a pricing which many other brands won’t make a device available with such specs, but this being a locked device, the users might have to think twice before choosing one, but, they aren’t paying anything upfront. Having an aluminum body with beveled edges and a compact size, the Concord II from ZTE comes with a 4-inch WVGA touchscreen display, which many might be choosing if they would need a smaller screen secondary phone, as the current flagship device range from different brands have set a standard of minimum 5-inch screens. The 4-inch screen has got the Gorilla Glass 2 protection. The internal specs are not that heavy, as the phone comes with a 1.2 GHz dual-core Snapdragon 200 processor (MSM8210 chipset) and that is supported by 1GB RAM (reminds you of the Moto E, right?). On the rear side, the Concord II has got a 5-megapixel camera with the LED flash support, and it can record videos at 720p HD quality, at 15fps. The phone runs Android 4.3 Jelly Bean OS and there is the stock ROM used in it, with nothing special in the interface, except for the pre-installed apps from the carrier and the Google Play services. The internal storage provided in the phone is 4GB of which around 2GB would be available to the end user because the other part is used by the OS and apps, but there is an option to expand the storage using the MicroSD card, and this can be to the maximum of 32GB. There’s a Li-ion 1820 mAh battery provided in the ZTE Concord II which is said to be giving 6 hours of talk time, and 250 hours of standby time, while the charging of the battery is quick. The phone comes with the standard connectivity slots like the MicroUSB 2.0, 3.5mm headset jack and the dual microphone for the noise cancellation while talking on the phone or while recording a video. 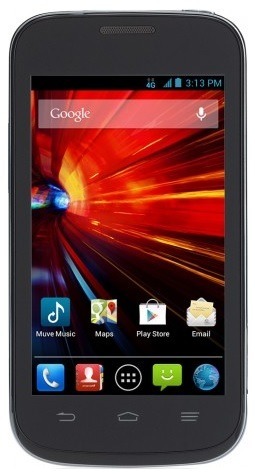 The ZTE Concord II is to be made available from May 19th via the T-mobile and MetroPCS networks. The stock Android experience is what might attracting many users, who don’t want a clutter of the bloatware provided by the OEMs generally.